The initial target was NOT to produce a model, but to provide hands on training in quantitative macroeconomic analysis. We agreed to use as a training exercise the construction of a macromodel, step by step through the hands of the participants. The model was just a side-product of the training. Once the model materialized, MINECOFIN realized that this model might be used also for more than training. b) Fiscal and socio-economic policy simulations of scenarios (what if/ impact analysis). Please note that Marumo is including a Poverty Module that translates macro economic developments combined with data from EICV into change in share of the households below the poverty line. These 6 visits in one and a half year have resulted in training in macroeconomics of on average each visit 21 Rwanda economists, in total 50 different persons. As a side-product this resulted into the Macroabc model for Rwanda, called ‘’Marumo” and Handbook MRM (307 pages and CDROM with all files). Then some labor mobility took place and the model was fading away. Almost two years later MINECOFIN decided to re-start the model not only for training and research, but also in budget preparation etc. and did sent four Rwanda economists to MMC to be trained 3-16 November 2013. After updating, Marumo is producing automatically output tables for BFP, IMF, EDPRS, Annual Ec. Report, and Vision 2020/2030 plus the change in share of population above the poverty line. However, after this visit MINECOFIN staff was very busy with other activities and Marumo got sleeping again. 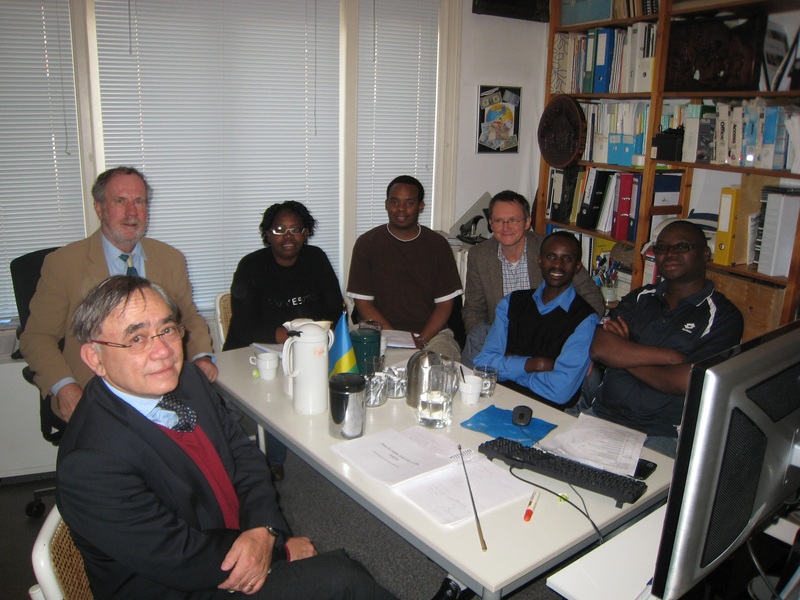 Friday 20th February Marcel Nshimiyimana (MINECOFIN) and Dr. Marein van Schaaijk and Sibren Vegter started a series of 17 Skype sessions. In all these sessions the model was running through the hands of Marcel. Marein and Sibren could see his screen thanks to ‘’share’’ in Skype. So the consultants did not even touch the computer and all calculations during Skype and preparation before went completely through the hands of Marcel. We did Skype 17 times, each time one hour. Already 27th Feb Marcel finalized the Annual Update. (Marumo had not been updated after November 2013). This proves that the whole annual update can be done by one person in just one week. Next step was to go through all assumptions and discuss their plausibility and from there the plausibility of the results. We compared the MARUMO results with the data in IMF art. IV Rwanda December 2014. In MARUMO a special sheet “IMF” is comparing output MARUMO with most of the tables in IMF report. Then we calculated from the detailed BOP tables with forecasted data in constant and current prices of main exports products the total exports volume growth and price, and injected that in assumptions. We did the same for imports, but did not inject that result in MARUMO because the imports are endogenous in the model. We compared the fiscal results in MARUMO with preliminary Budget figures. They differ because Budget is including policy measures, but the first run of MARUMO is excluding these. So we injected add factors in several fiscal variables. Furthermore, we made a sheet “SHADOW” to bring MARUMO in line with Budget, but with the model still running. We also discussed GDP from FY to CY using quarterly figures. We spend several Skype sessions in improving the baseline. And Marcel discussed preliminary results with his colleagues and management. This iterative process resulted in a baseline. Then we did run several variants to see what the effect of alternative assumptions or policy measures are on the economy: Real Sector, Fiscal, External, Monetary, Household sector, and the change in numbers of households above the poverty line. We could do that because also the poverty module has been updated. The whole Annual Update went completely through the hands of Marcel, the consultants never even touched the computer, only gave advice by Skype. So only one MINECOFIN economist can do the Annual Update in just one week successfully. Then the process of step by step improving the baseline started, including discussion of preliminary results with colleagues and management. Furthermore, several sensitivity and policy scenarios were run. In total we had 17 Skype sessions in 8 weeks. In July 2015 the Paper Rwanda Scenarios was made. The paper starts with a brief description of Marumo, including underlining of the fact that macroeconomic models incorporate several inaccurate coefficients, so they cannot be used to proof something, but can be helpful for better understanding of the economic processes. Then the economic development of Rwanda 2000-2015 and baseline 2015-2030 is discussed including development of poverty using the database and macroeconomic model Marumo and Poverty Module translates macroeconomic developments into changes in the numbers of households above the poverty line. Then several policy scenarios are run, including the effects of policy measures like export promotion, promotion of productivity, changes in taxes on: GDP to sectors of industry, government deficit, foreign exchange stock, number of households above the poverty line, including breakdown to socio-economic groups and regions of Rwanda. Furthermore Micromacro Consultants did produce a Micro Poverty Module, running in Excel, based on EICV3 and produced documentation to this Micro Poverty Module will be made). Furthermore in a video clip is demonstrated how to use this Micro Poverty Module to analyze poverty (to socio-economic groups, gender, regions, etc.). Also two notes were made comparing EICV3. The Micro Poverty Module, including Manual, the video clip with explanation how to run it and two notes have been sent to the persons in Rwanda involved in Marumo project. But this model, video clip and notes are NOT available on www.micromacroconsultants.com. During October 2015 again some labor mobility at MINECOFIN Rwanda took place. Actually the staff most trained in Marumo left. So Marumo is sleeping again, while waiting for new staff.